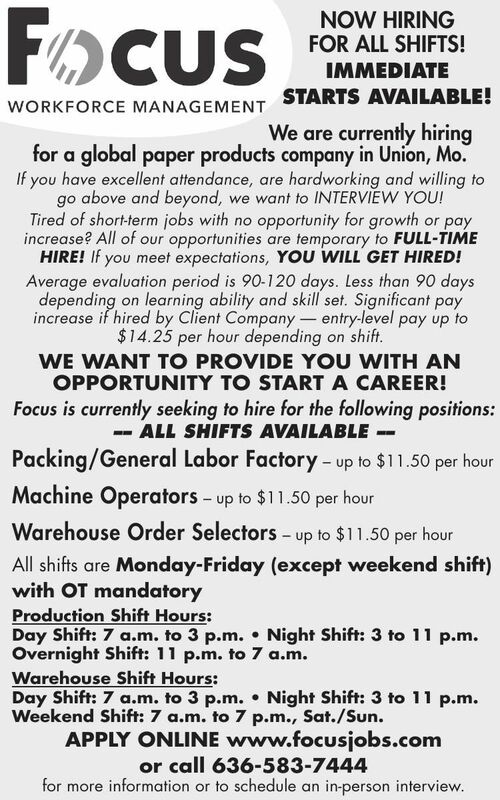 for a global paper products company in Union, Mo. go above and beyond, we want to INTERVIEW YOU! HIRE! If you meet expectations, YOU WILL GET HIRED! $14.25 per hour depending on shift. OPPORTUNITY TO START A CAREER! Day Shift: 7 a.m. to 3 p.m. • Night Shift: 3 to 11 p.m.
Overnight Shift: 11 p.m. to 7 a.m. Weekend Shift: 7 a.m. to 7 p.m., Sat./Sun. for more information or to schedule an in-person interview.